After landing at around 11 the previous night we got to our hostel by 12.30. Once I had worked out how to position the mosquito net over the bed it was pretty much straight off. We had a leisurely morning and were to be met by Bosco at 11.00. As this was TIA (Time In Africa) this turned out to be a little later..
Our first port of call was to be a tour of the Katwe slum where Bosco and many of the children from Mlisada have been living. I have seen the slums before in my previous visit in 2013 but it always take your breath away the level of poverty that the people of the slum have to put up with. That said when we were walking through there were many smiling faces greeting us. Kampala has recently had some storms and the mud roads were very treacherous. The basic sewage system was explained to us: there were open trenches running through the slum where people threw all their waste in which flowed down through the slum. No wonder disease and death is still so prevalent in the slum. We walked to the new Mummy Foundation site, which is very close to the old site. The old site housed upwards of 60 girls in a room about half the size of a normal classroom. They have a new building, which has much more space, currently 2 class rooms a couple of offices and a room that will soon be a library. The second floor is soon to be started so hopefully soon they can open their doors to many more girls and also helping to educate their mothers. We moved on to Mlisada where Kalima Franke was taking a quick rehearsal with the senior band before they went off to play at a wedding 45 minutes outside Kampala. Since word has spread about Mlisada they have been getting calls about playing at events and most weekend now the band is out playing somewhere. All 25 of them managed to fit in the minibus, which was an achievement as it usually holds about 12 with no instruments! Today was mainly a rest day and we spent the morning running through some course detail as well as some much-needed practice ( I speak for myself, not John..) We met a few more of our teachers in the afternoon as we headed out to Lake Victoria for a bit of local fish ( head and all..) Lake Victoria is about 30 minutes from Kampala, although it’s not too far distance wise, It’s just traffic in Kampala can make London seem quite free flowing. It was a beautiful setting, overlooking both Kenya and Tanzania, to have chat with new and old friends and to see how excited they were about the forthcoming course; I think we’re in for a lot of questions…! We then went onto to Mlisada to hear a performance from the main band conducted by Godfrey, the senior brass tutor. It was the usual energetic vibrant performance even with the rain coming down which was a little unexpected. I can get plenty of that in Wokingham…. early and looking forward to the course. We also welcomed some teachers from Kenya who are joining the courser for the two weeks. It was a full morning with plenty of questions, which was encouraging. The aim of the course is to cover the basics in brass teaching, and many of topics the teachers have covered but it is giving them confidence to deliver it to their pupils. Lunch was provided for everyone, which was a typical Ugandan dish although for many of our teachers having Chicken, was a luxury that they would only have once a month. We worked on for another two hours covering pulse and rhythm including some rhythm games designed to help their students. and the pupils picking up on faults we had addressed during the day. We then went back to Mlisada for a band rehearsal in preparation for the concert next week and played some favourites such as Slaidburn, cinema paridiso, accompanied by an extraordinary gymnastic performance as well as a new Abba medley which down with our Abba fan Kalima Franke! which included forbidden rhythms and find the mouthpiece which went down very well! We then recapped the previous module and were encouraged to see how much the teachers had taken on board. We did have to take a break as the rain came with a vengeance and as our room had a corrugated iron it was impossible to hear anything. The music making in Mlisada is extraordinary and a lot of the learning is by ear, I would love to have the aural capacity of some of these pupils but some pitch and notation has not been covered too much so this proved very beneficial to them, although pointing out that the aural side of learning is still just as important. The orphanage caters for about 200 people, mostly children and many with disabilities, some extremely severe. 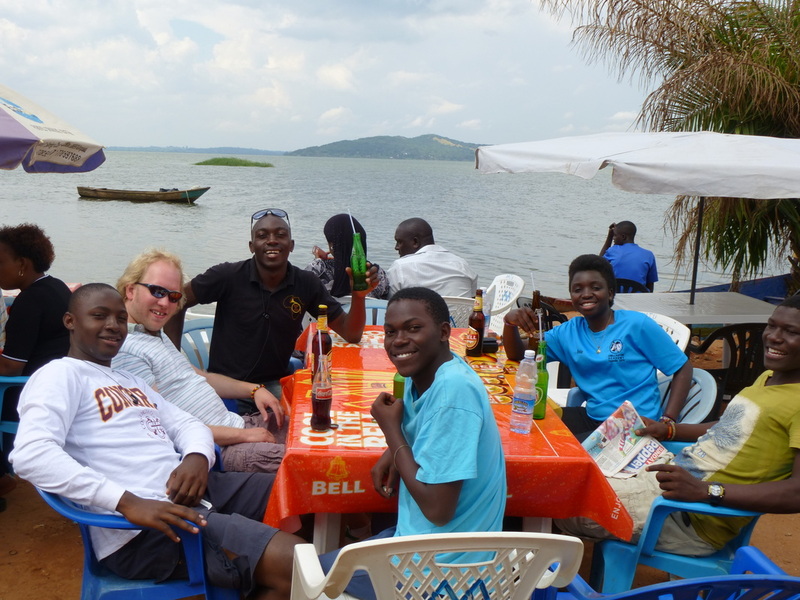 It was a bright colourful place and like the Katwe slum we were greeted with many smiles. Good Shepherd has two brass groups and we were treated to a performance of some of the pieces they have been working on. Before that our teachers were warming up groups of children and it was so encouraging to see many of the brass techniques we had worked on. We have heavy rain in the UK but this was something else. The rain came down for 30 minutes or so without break and we had to wait until it died down a little before jumping in the bus. On our way back to Mlisada some of the mud roads in and around the slum were turned into rivers. We noticed that some people live in the shell of cab trucks on top of buildings to escape from the rain..
We still managed to have a rehearsal although a little wet still and the highlight was a rousing rendition of Happy Birthday, For he’s a jolly good fellow and congratulations for one of our musicians. This was followed by a birthday cake, which went down very well with the children at Mlisada. Bearing in mind they usually only eat meat once a month, birthday cake is a real treat. The afternoon was spent visiting the Bethlehem Orphanage just outside Kampala, which is linked to the Good Shepherd Home and houses the boys. The building and grounds, which are quite spacious, were originally designed for 115 boys but had nearer to 215 owing to the demand. Like Good Shepherd this is a vibrant positive place but has many boys with terrible mental and physical disabilities. We were treated to a performance from the band and like yesterday it was encouraging to see the teacher work with small groups of pupils beforehand to warm them up and assess any problems they might have. It was another exciting performance led by Kalima Franke who has boundless energy and enthusiasm; he really sets such a good example to everyone. We travelled back to Mlisada for our band rehearsal which was a bit drier this time and worked on some of the pieces that the band are playing at a youth festival tomorrow as well as a bit more Abba for the concert next week. Another full day but a really successful one. Today was a little different as the various projects that Brass for Africa supports were invited to a Youth Day at Kaparansiga juvenile rehabilitation detention Centre to take part in a celebration of youth. The centre is based about an hour outside Kampala but before we set off we managed a warm up led by Uncle Godfrey before branching into warm ups based on chords to help them think about the sound they are producing. We set off at about 9.30 with the band in one bus with the drum kit and John’s tuba strapped to the roof. He wasn’t really expecting to see it again. The journey took us out to the country and you could really see what a beautiful country it is. We reached the centre at about 10.30; it is quite an imposing building but has been left to ruin for the past 30 years or so since Amin. Brass for Africa has arranged two of our teachers to go into the centre twice a week to start a brass band and I was really impressed with what they achieved in such a short space of time. The day started with a march around the centre and out through the local community accompanied by Mlisada Band playing a variety of tunes, including the floral dance which rather took me by surprise. I have never been a natural at marching and playing and today proved no different especially as you had to keep your eye on your feet at all times. The cows seemed a little surprised and alarmed to see a hundred or so people marching past them. We returned to hear the 4 bands, The Centre band, Good Shepherd Home, Bethlehem Home and Mlisada. They each played a tune whilst being inspected by the officials. Then the games began, which included a sack race, peel the vegetable, tug of war and an egg and spoon race. All being accompanied by a commentator who made it sound a little like It’s a knockout. We then had a gymnastics display and after Mlisada played a few of their pieces including accompanying a few of their dance troupe. The sport then followed which had a netball game and what was possibly the longest volleyball game I’ve ever seen. After, we an audience with the director of the centre and a Government minister .Jim mentioned the difference in attitude to the children learning brass instruments and hopefully this can be built over the year. We headed back to Kampala shortly after, unfortunately no time for a rehearsal but it was a long day for the pupils and It was great to hear all the bands that Brass for Africa are supporting in one concert. We couldn’t come to Uganda and not treat ourselves to a weekend away to see some wildlife. The Trott entourage drove up to Murchison Falls about 8 hours north of Uganda with at least half the roads being dirt track. I will be booking a trip to the chiropractor when I get home…. We arrived up Friday late afternoon and relaxed whilst watching the Hippos in the Nile. They came even closer later on as a couple were spotted roaming in the campsite. After a comfy night glamping we had a morning safari, catching many giraffes and elephants before having a trip on a the Nile and a walk up to the top of the Murchison Falls. Not the easiest thing at 4500 feet above sea level. We returned back on the Sunday morning and our driver Mark did very well to nurse the car back the 400 mile journey with a bearing sheared off. It was also a welcome rest for the teachers back in Kampala as It had been a very full on week for them. We started again first thing Monday morning and finished the last part of the course before demonstrating conducting which proved very popular. We also got the hymnbooks out to work on sound and balance. concentrated on the breathing aspect the sound just grew and you could feel the hairs on the back of your neck rise as they played the first chord. The afternoon was spent helping the junior band and seeing our teachers work with small groups and the full band, followed by a very constructive rehearsal with the main Mlisada band in preparation for our concert on Thursday. Our new Abba medley seems to be gelling nicely and John took them through Slaidburn, as well as Sonrise written by Jim Trott and beautifully played by son Angus and one of our teachers, Lillian. The band is really shaping up nicely and we’ve both been impressed by the teachers’ focus and dedication in what are very long days, in 30 degree heat. The day started back at the Texas Club where now the course had gone into revision of the previous topics as well as some warm ups a hymn tune or two and some more conducting practice for our teachers. We had mentioned to Ronald, Frank and Lillian that they would be teaching a lesson in the morning and our special guest was Gracie Trott. Gracie is extremely musical but has never played the trumpet before even though Angus and Jim play. Our teachers split the lesson into three sections, each taking a section and using the techniques we have been talking about for the last week. All of them showed good teaching skills and were very enthusiastic and encouraging to Gracie. 30 minutes later Gracie was making a good sound and was producing different pitches. She seemed very pleased with her lesson and said that she now wants to play the trumpet. Not sure how well that will go down with her clarinet teacher…! After lunch the afternoon was spent first at the Bethlehem Orphanage to see the teachers deliver a well-structured lesson, which included notation for the first time. And there was more excitement as 4 new trumpets arrived so we had 4 very happy children. Band practice for the Mlisada band was at the Texas club for a change as that is where the concert is going to take place. It was good for them to get use to the acoustic because it is a 3-sided stone building with a corrugated iron roof so the sound was quite lively! The rehearsal went well and John got the whole band to sing Eventide before playing it, which really helped the sound. It was also good to change the venue as I think they seemed a little more focussed as it was somewhere different. The time was really running away now and we had one last full day to consolidate some of the teaching skills and fine tune the band. Our morning was spent travelling to Kampiringisa Rehabilitation Centre, the journey was a slow up there and was not helped by a lengthy chat with a traffic officer.. We had a tour of the centre, which was quite difficult to take in as it must be a challenging place to stay but for some of them the choice is no better. The good thing is Brass for Africa has secured a 3 year deal to teach there so at least some of the children have something t look forward to a couple of times a week. We watched our teachers take a class of about 20 students, although eventually we hope to teach up to 50 pupils. We also saw a lively drum sectional taken by Frank and Edrine, including some marching, never my strong point as I may have mentioned. We had a slightly more straightforward journey back although the traffic coming into Kampala was awful so we grabbed lunch en route and got back to teach another revision session which included explaining minor scales. This had been a sticking point for them ( not only them I imagine…) but by the end they had it cracked and applause rung out, that doesn’t happen at home..
Our final full rehearsal then took place as we ran through all the pieces and made sure they had not forgotten to put the pianos in place. We had bought pencils for all and we urged them to write whatever it took on the page to remember to put the dynamics in. They are an exciting band but even more so when they have that light and shade. Pegs were also given out so the music didn’t end up all over the rehearsal room. The rehearsal went well and we tried to get them play the right style in Katwe Dawn by relaxing their posture, we did point out that this was a one off. This seemed to do the trick and Angus Trott did well to stay on his seat so relaxed was he…lazy bugger..! And so we reach our last day, we had the luxury of a late start and set off from our hostel at 9.00. The morning was spent revising a few techniques that the teachers were keen to cover which included the dreaded transposition. We also ran through the assessment sheets to make sure that everyone could cover all the topics we had covered. The short session was followed by a rehearsal with the Junior Band led by myself and John. We brought some new warm up and rhythm sheets as well as new piece that we were going to teach them in preparation for the afternoon’s concert. We then handed the conducting duties over to teacher Godfrey and martin to finish the session off. and a rehearsal with the Mlisada choir who were going to perform a joint piece. The balance was always going to be an issue but the band once more showed their newfound piano skills. The concert took place at 3(ish) and we were pleased that the deputy high commissioner of the British Consulate as well as a smattering of British Airways pilots. The Junior Band kicked off and played very confidently, including the new piece they learnt, much to the relief of John and Myself. Jim kicked them off with one of his many amazing works, Mlisada March, followed by Katwe Dawn, composed by Alan Fernie specifically for the Mlisada Band. Eventide followed which included the first verse being sung and the second played, moving stuff. John then conducted them through an exciting performance of Slaidburn which nearly took the roof off. Sonrise (another J.Trott piece) was performed beautifully by Angus and Lillian and sympathetically accompanied by the band. I conducted them through the new Abba piece, which included a satisfying piano near the end, which I had been banging on about all week. We followed this by the award ceremony to our teachers, who all gained certificates with Men of the Match going to Frank and Lillian. The concert was a great success and we were very proud of the work the band put in over the week, it was very full on for them and they did a great job. We were also very proud of the work our teachers have put in over the two weeks. It has been a lot of work to take in but their focus has not wavered over the two weeks and they seemed to have got a lot out of the course. I am sure they will continue putting this into their teaching in the future. A final thanks though to Bosco, Godfrey and all the teachers and pupils in Kampala who made this another incredible African Journey.